Carp is an interesting cycling destination for a variety of reasons. 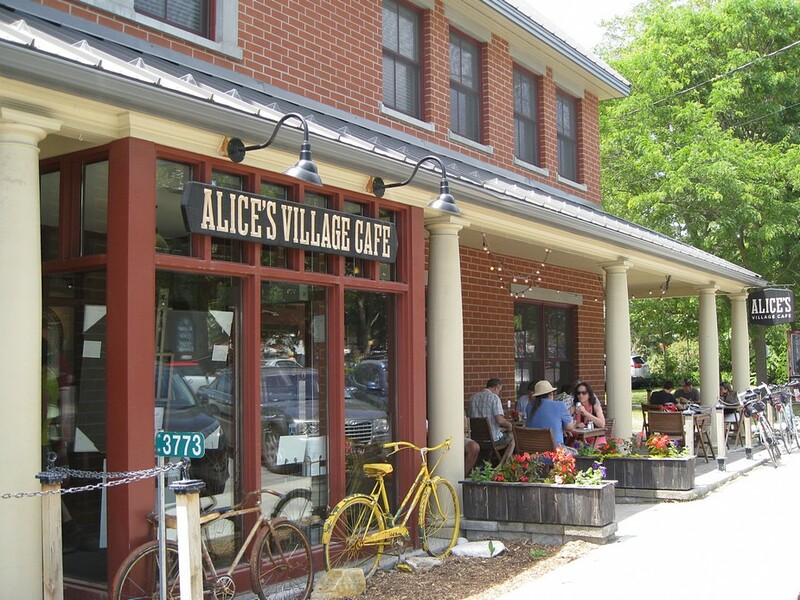 First, it’s home to Alice’s Village Café, which seems to have become the hang out of choice for a great many cyclists out for a ride on the rural roads in the area. 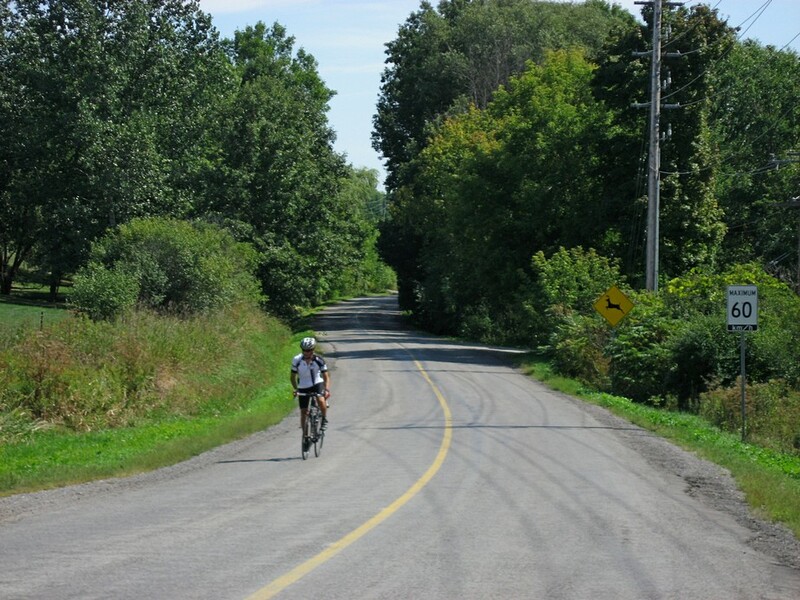 Second, it’s a fairly good destination for people who are used to riding on pathways and bike lanes, but are interested in exploring some quiet country roads. 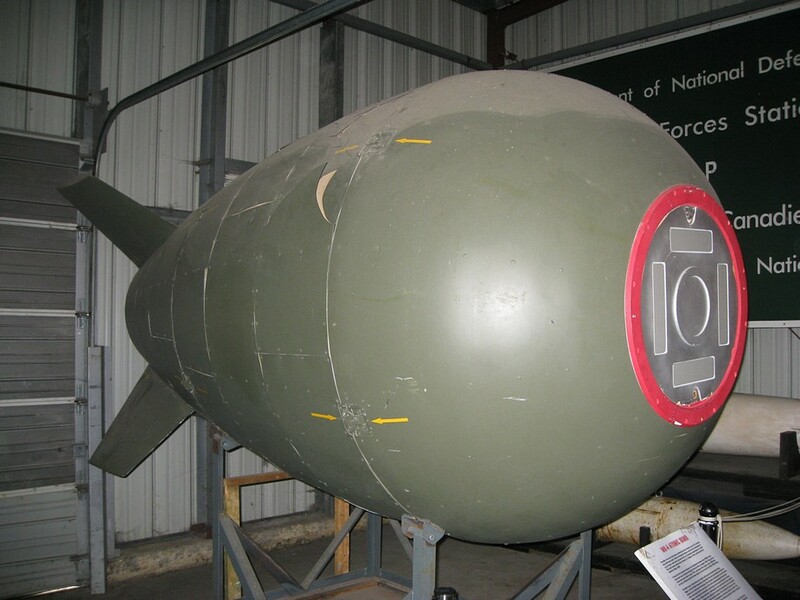 And finally, the village has a few worthwhile attractions, including the Diefenbunker Museum and various events that take place at the Carp Fairgrounds. 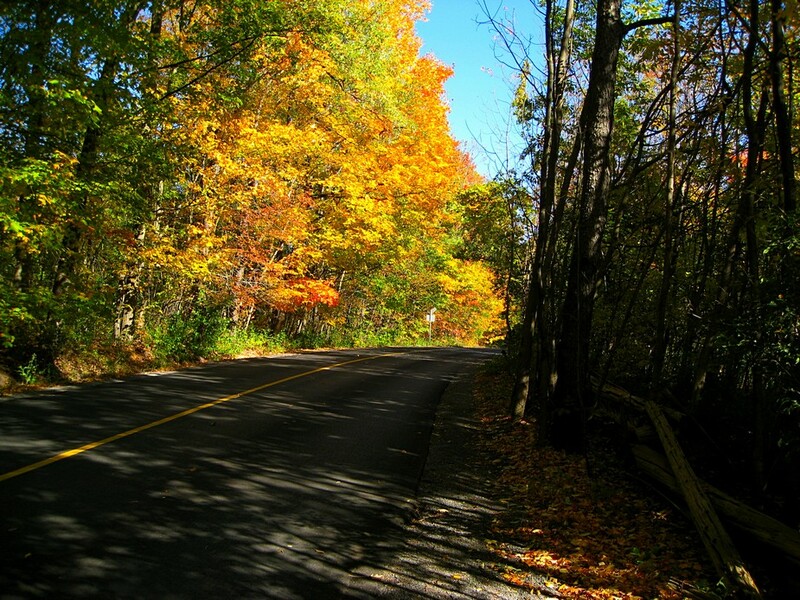 The ride to Carp is about 25 kilometres one way when departing from Ottawa’s west-end (for example, the Britannia Park area), and probably closer to 35 km when leaving from the downtown area. It’s relatively flat, with the exception of two small hills. While noticeable, they shouldn’t be much of an impediment, even for hill-adverse cyclists. 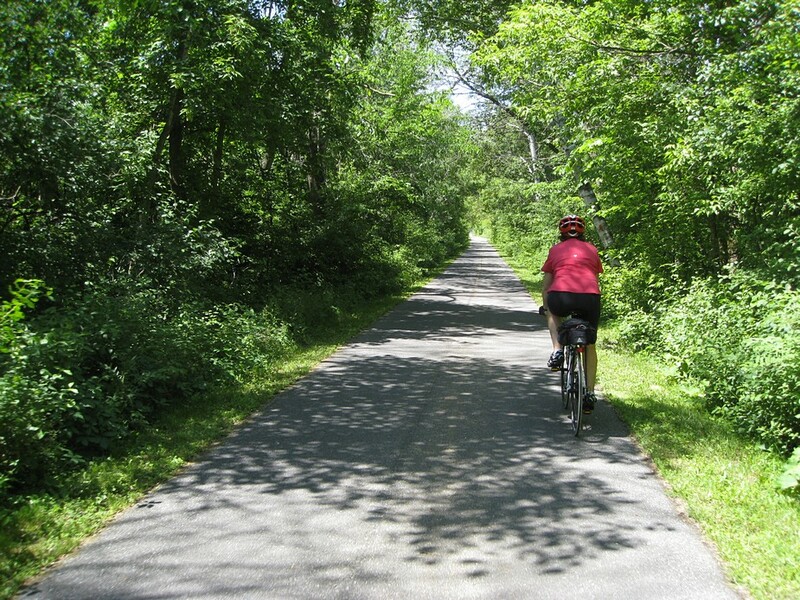 This ride starts off on pathways, then moves on to bike lanes and paved shoulders, and ends up on quiet country roads. These roads have no bike lanes or paved shoulders of any kind. However, except for a slight increase during morning and evening rush hours, they generally have very little traffic. 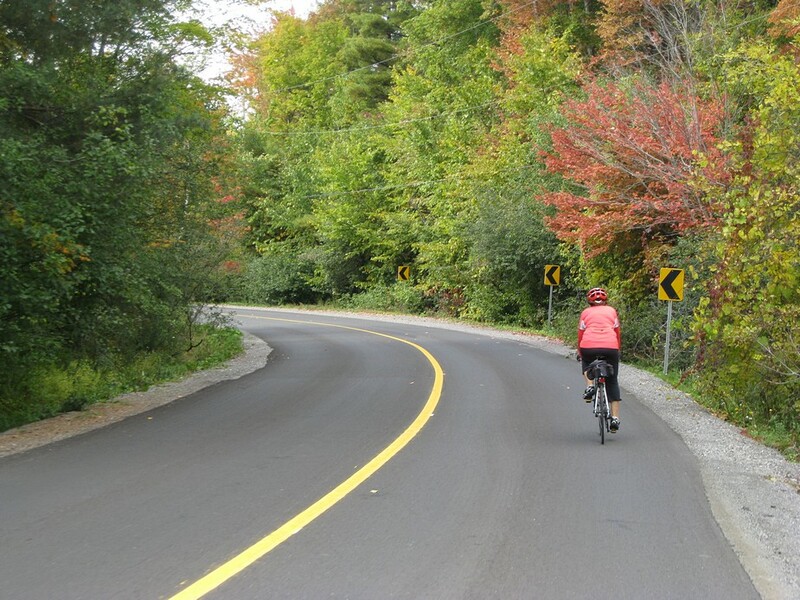 As already mentioned, they are a good choice for people who generally stay on pathways and bike lanes, but would like to expand the scope of their rides to include some country roads. 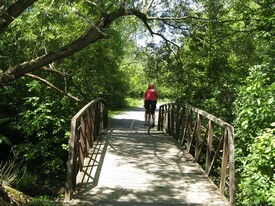 You begin this ride by heading west along the Ottawa River Pathway. When you cross Carling Avenue you’ll officially be on the Watts Creek Pathway. A short time later you will cross Holly Acres Road, and have to ride about a hundred feet on Aero Road before picking up the pathway on your left. 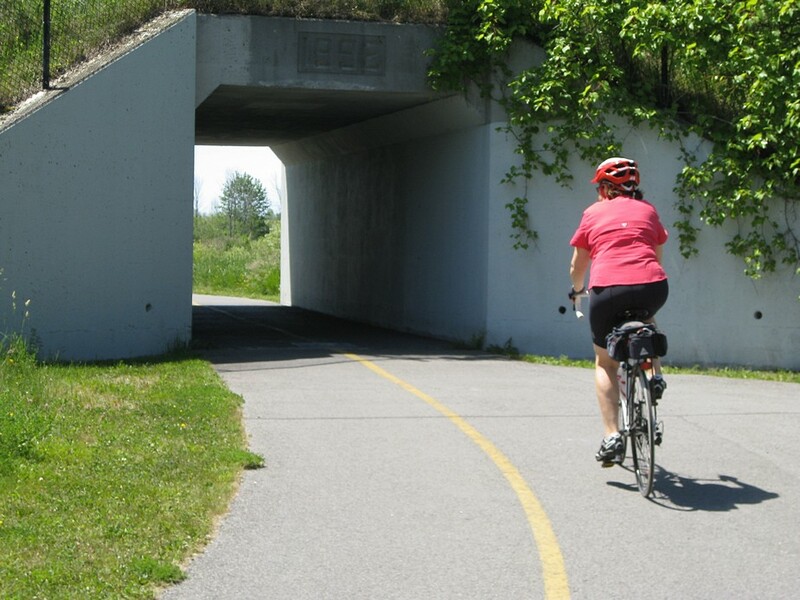 The pathway will cross Corkstown Road and Moodie Drive, and will eventually pass next to a golf driving range and then go under an overpass for a railroad line. About half a kilometre after this overpass, you’ll have to turn right to go to Burke Road. There is a small sign on the pathway to indicate the turn, but it’s easy to miss if you’re enjoying the scenery or engaged in a conversation with a fellow cyclist. 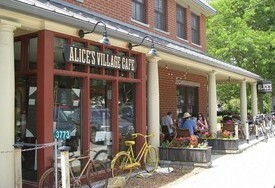 Alice’s Village Café in Carp. Once you take the turn, you’ll soon end up on Bruke Road, a short residential street in the middle of nowhere. Follow it to Carling Avenue, where you’ll turn left and head west for approximately one kilometre. Getting to the paved shoulder on the north side of Carling can be a challenge because of all the traffic. 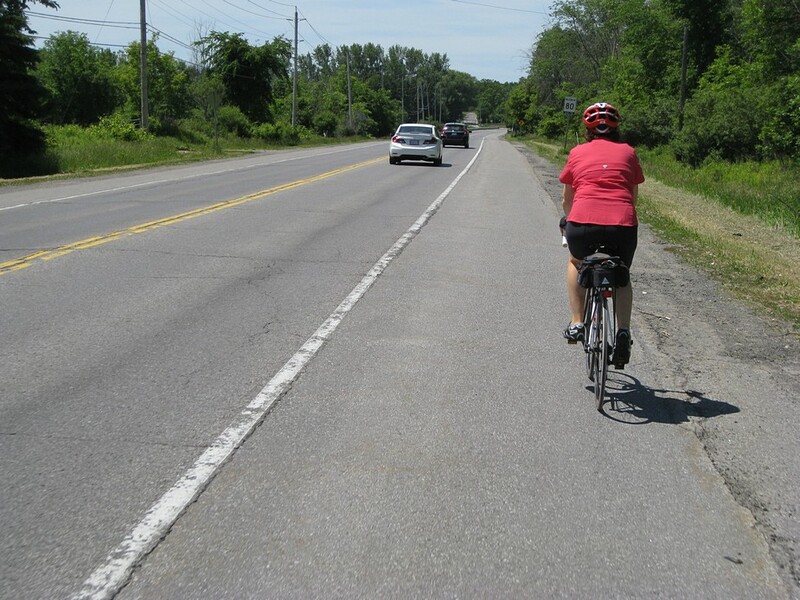 However, riding along this busy thoroughfare is really no problem because the paved shoulder is a generous 6 to 7 feet wide. At the traffic lights, you’ll turn right onto Herzberg Road which, a short distance later, automatically becomes Terry Fox Drive. This road passes through Kanata’s high tech business park, and has a good 3 to 4 foot wide paved shoulder that’s officially designated as a bike lane. 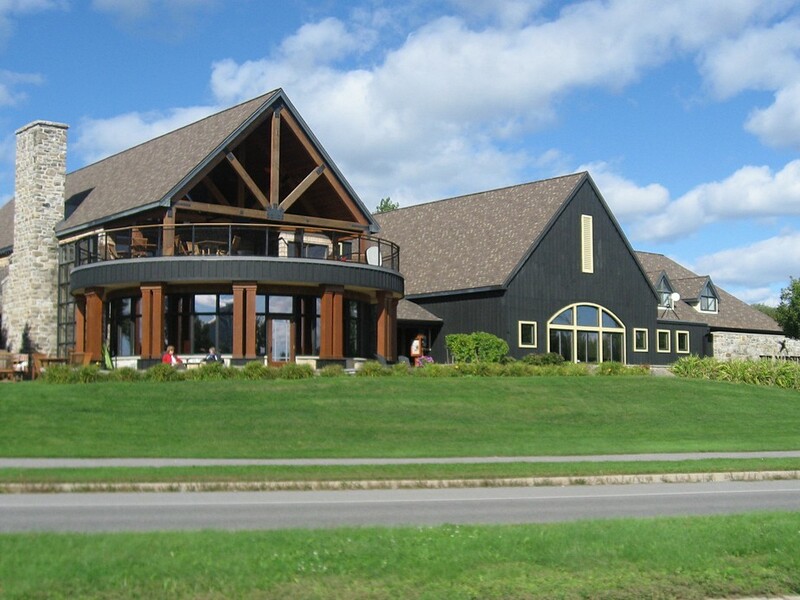 In about two kilometres you will turn right onto March Valley Road (right after the Marshes Golf Club Course). From this point onwards, you’ll be riding on country roads with no paved shoulder or bike lanes. 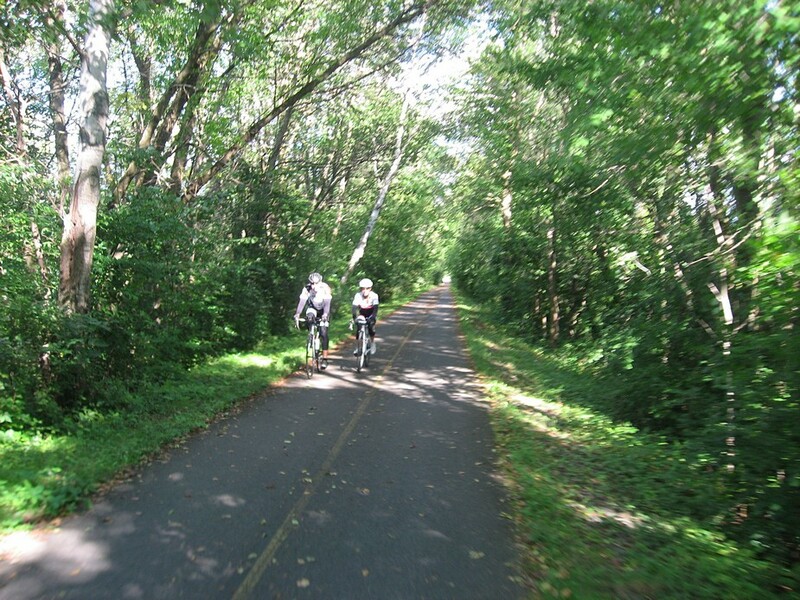 If you would like to do a little more cycling, you can easily extend this route by going straight on March Valley Road instead of turning onto Klondike Road. This route swings out toward the Ottawa River, loops to the west, and runs through Carp on your way back to Ottawa (see map). It will add a little over 30 kilometres to your ride, and with the exception of the last section, it runs on roads that have very little traffic. As you continue on March Valley Road, you’ll find that it is quite nice, and at one point, it is covered with a treetop canopy. 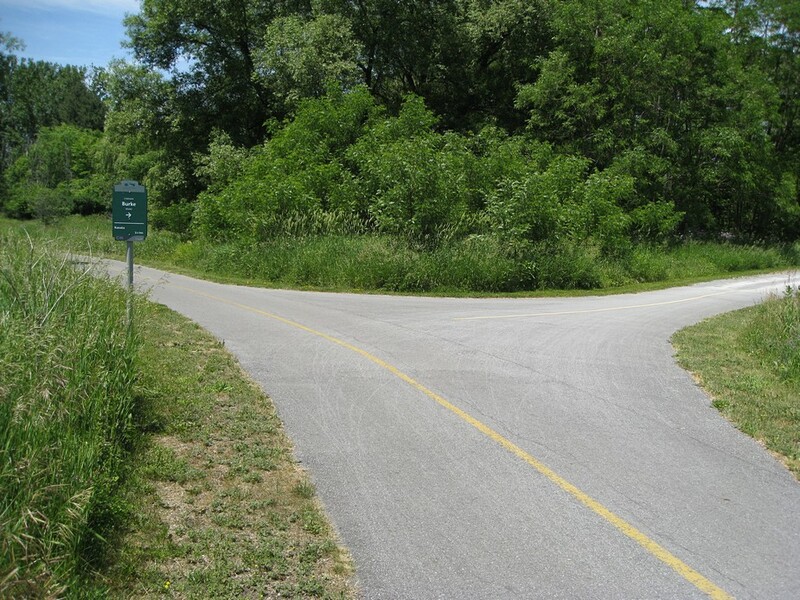 Go to the end of this road, turn right on Riddell Drive, and you’ll now be heading towards the Ottawa River. 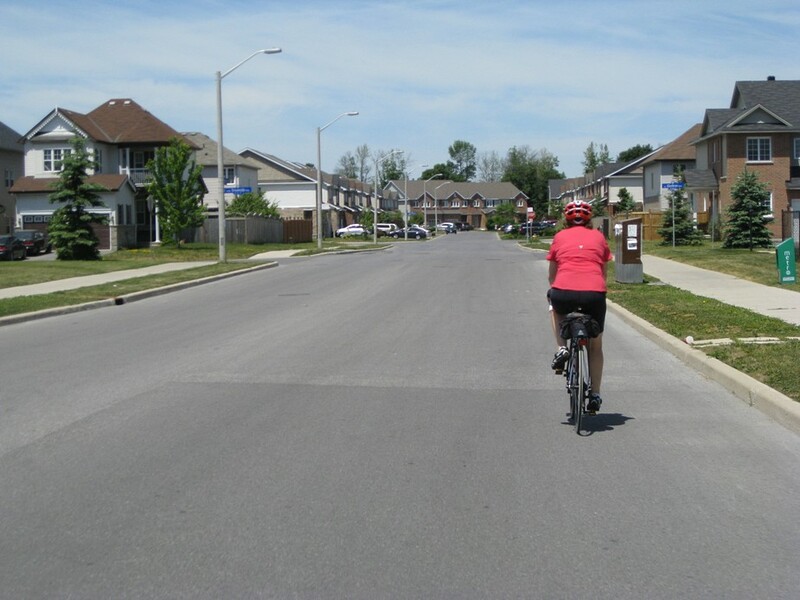 After a while, Riddell Drive makes a 90 degree turn to the left and becomes Sixth Line Road. After Pinhey’s Point, continue on Sixth Line Road until you get to Thomas A. Dolan Parkway, where you’ll turn left (there’s a stop at this intersection). You’ll have to stay on this road for approximately 12 kilometres. Thomas A. Dolan Parkway is a long straight road with a couple of real hills. Luckily, the first one is a decent. The pavement is atrocious for a short section where Thomas A. Dolan Parkway crosses March Road. The rest of the road is rideable, although it is beginning to show its age. You will find a small strip mall on your right where Thomas A. Dolan Parkway crosses March Road. It has a small grocery store to get a snack or something cold to drink. When you get to Carp Road, turn left. Unfortunately, the next 5 kilometres of Carp Road can be somewhat busy (nothing unbearable, just a little more traffic than roads up to this point). Carp Road will take you right into the village. 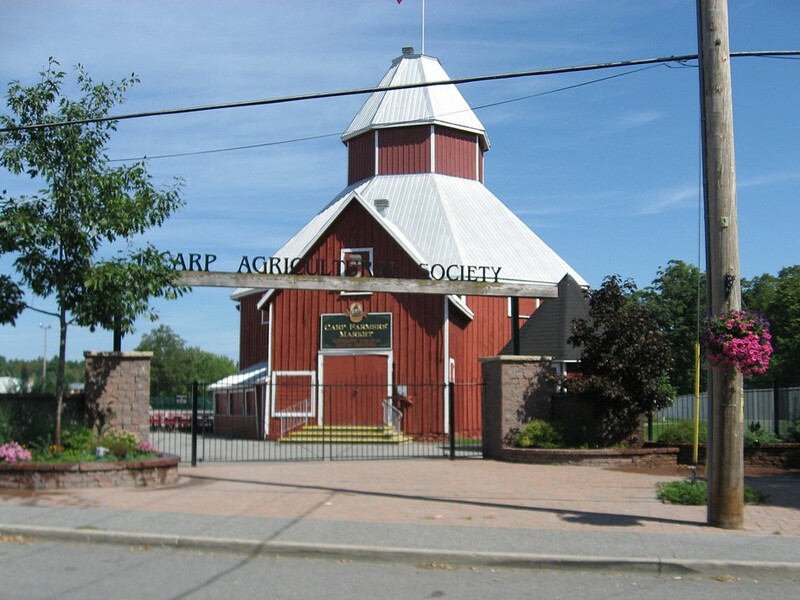 After a while, you will see the Carp Fairgrounds on your left, and shortly afterwards, Alice’s Café on your right. Once on Klondike Road, you’ll have to zig-zag through a suburban neighbourhood. The routing isn’t overly complicated: continue on Klondike Road until you hit a stop, and turn right onto Marconi Avenue and continue until you hit another stop, and turn left onto Maxwell Bridge Road. This will soon bring you to the traffic lights where you’ll cross March Road (the largest and busiest road in this part of Kanata). There will be a McDonald’s on your right. About 100 metres after crossing March Road, you’ll turn right onto Old Carp Road. Basically, you’ll stay on this road all the way to Carp. The first part of Old Carp Road may be a touch busier than some of the other roads you’ll be cycling on, but this shouldn’t be much of a problem. 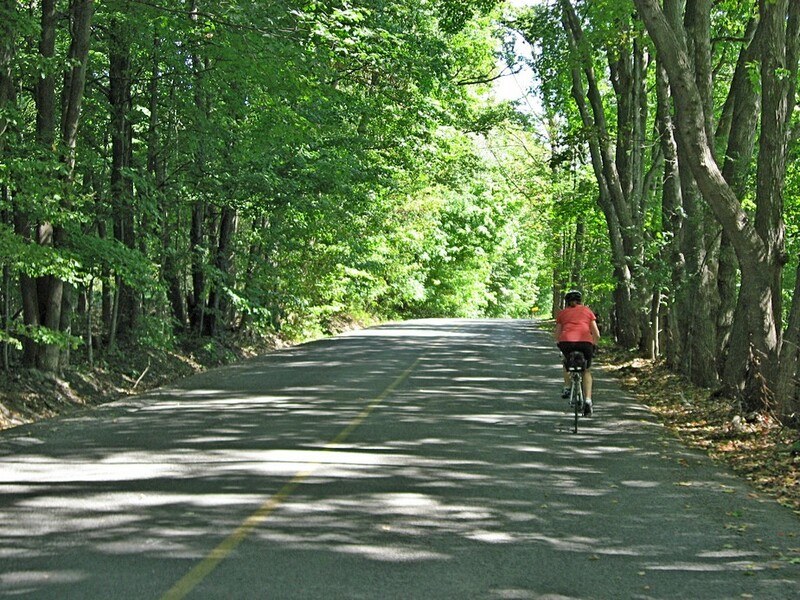 After crossing Old Second Line Road, Old Carp Road runs through a nice wooded area, and this will give you the sense that you’re finally getting away from Ottawa’s urban environment. This is also where you’ll encounter the first of those two small hills. Old Carp Road eventually crosses Huntmar Drive and intersects with March Road (again). On the other side of March Road, Old Carp Road becomes Donald B Munro Drive. For all practical purposes, Carp starts on the other side of March Road, although you will have to cycle a little over a kilometre to get to the actual village. Ironically, this last kilometre will be on one of the busier roads of the entire ride. They recently built some new sub-divisions around Carp, and this is generating more traffic on what used to be a very quiet road. It’s nothing too serious, but the increased traffic is noticeable. You will be in the heart of Carp at the intersection of Carp Road and Donald B Munro Drive (Carp doesn’t have much of a traditional downtown area). From here, you’ll turn right onto Carp Road and pedal for a few hundred metres to get to Alice’s Café. Unfortunately, you’ll have to climb a small hill to do so. 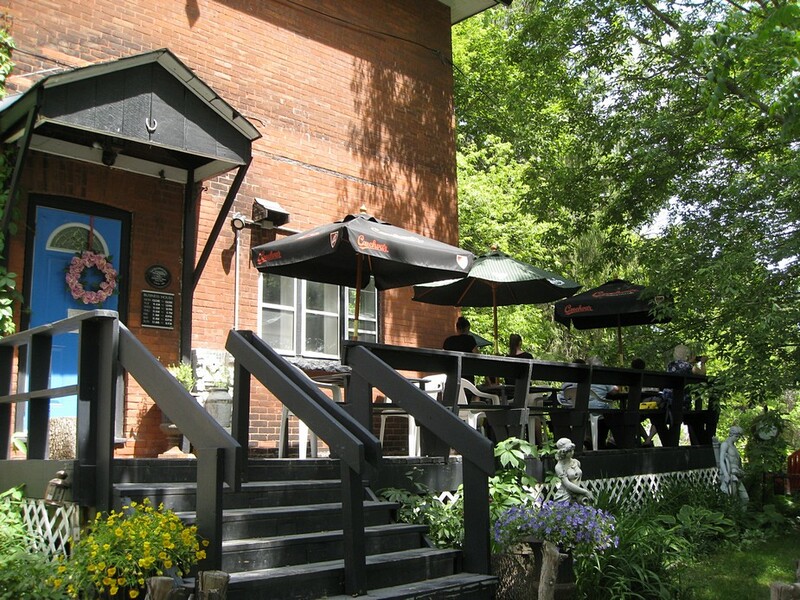 It’s as if the hill was strategically situated to work up your appetite just before your stop for a bite to eat. 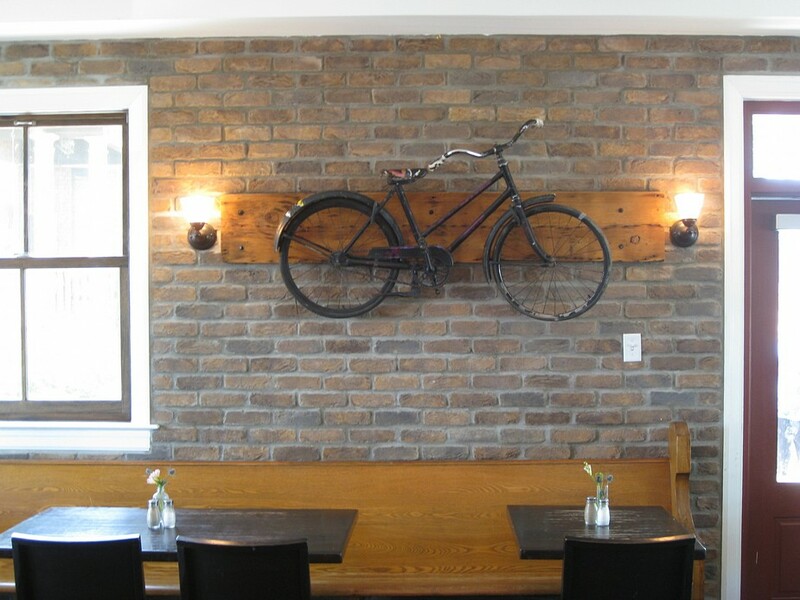 As already indicated, Alice’s has become a very popular gathering spot with cyclists riding around in the area. At certain times of day, it seems that half its patrons are cyclists. It has a relaxing coffee shop atmosphere with indoor and outdoor eating areas. Its soups and sandwiches are a little more expensive than standard fast food outlets, but they are made with good food and are very tasty. All in all, an enjoyable place to stop for a rest, coffee, or something to eat. Be warned that what make Alice’s popular with cyclists also makes it popular with non-cyclists, so that place can fill up quickly. To get a table, you might want to time your arrival just before or after the busy lunch hour period. 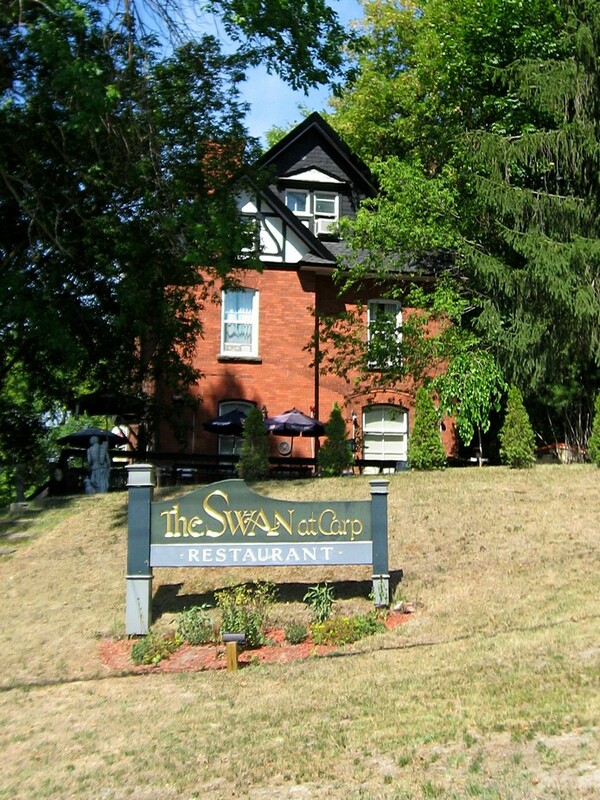 While Alice’s is often the favourite with cyclists, Swan At Carp is a local pub that is also worth considering. It’s only two minutes away. To get to it, go 50 feet past Alice’s, turn left on Falldown Lane, go down the small hill, and look for the entrance to Swan At Carp on your right. It’s interior has a distinctly country pub ambiance about it, while on the outside, it has a nice eating area on large deck. Like Alice’s, it is well rated by reviewers on Google and tripadvisor. 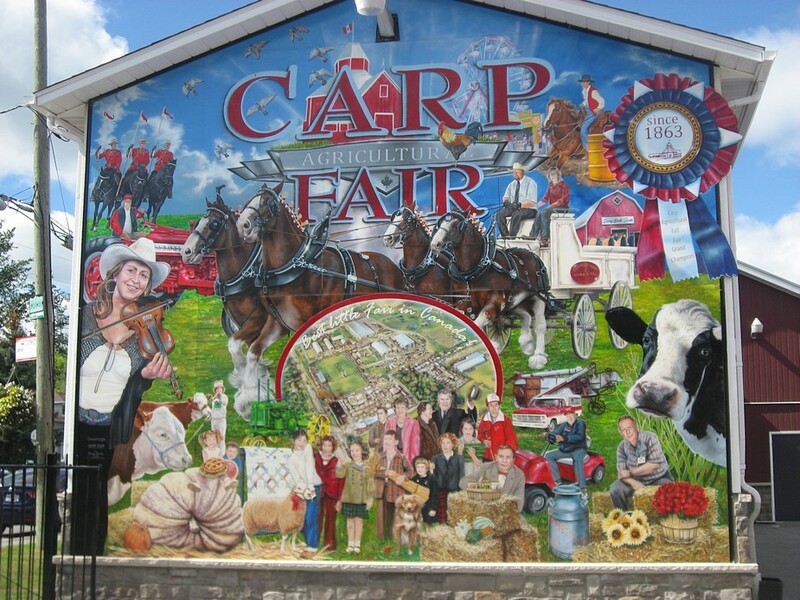 In terms of attractions, the Carp Fairgrounds are located almost opposite (diagonally) from Alice’s. 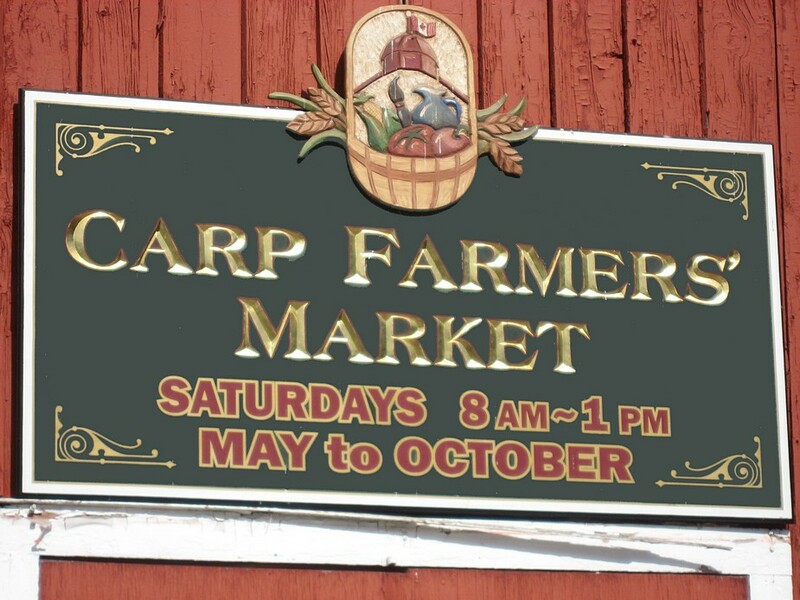 It’s home to the Carp Farmers’ Market, which is open every Saturday from 8:00 am to 1:00 pm from May to October, and features over 100 vendors. Needless to say, it’s also where the famous Carp Fair takes place in late September. 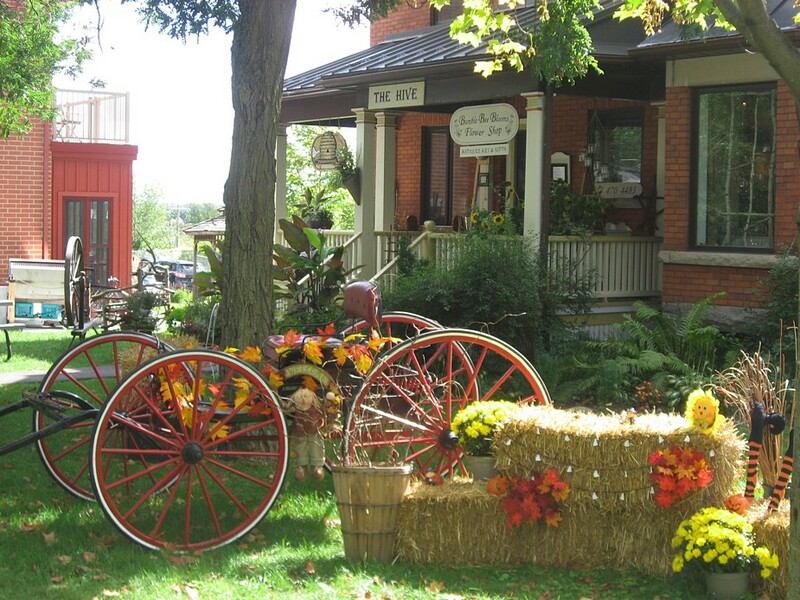 It has been going strong for 153 years, and bills itself as the “Best Little Fair in Canada”. The only downside with the fair it that it tends to increase traffic in the immediate area. 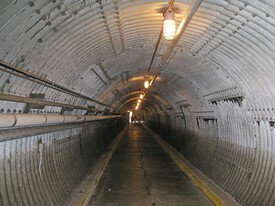 The Diefenbunker is another noteworthy attraction. 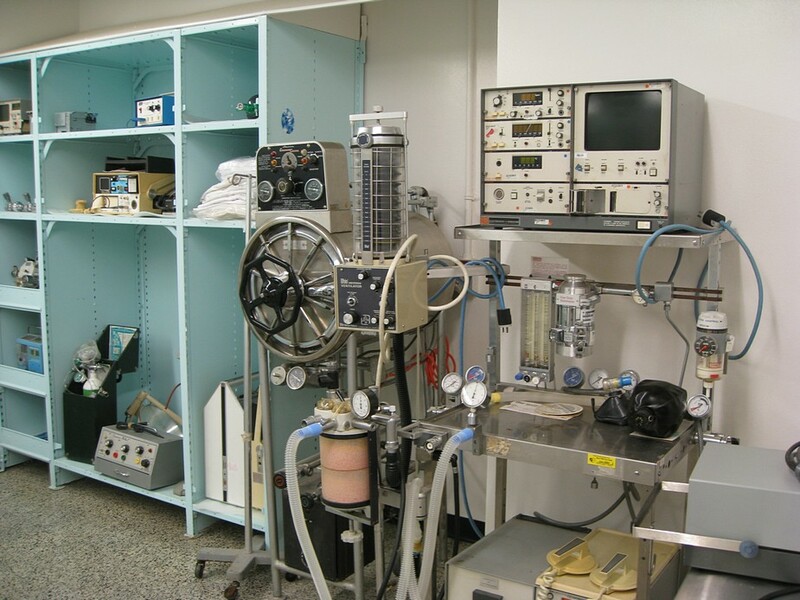 It is located on Carp Road about half a kilometre past (north of) Alice’s. There is a sign on the road indicating where to turn. For those of you who may be unfamiliar with it, the Diefenbunker is a 100,000 square foot underground bunker that is a relic of the cold war. 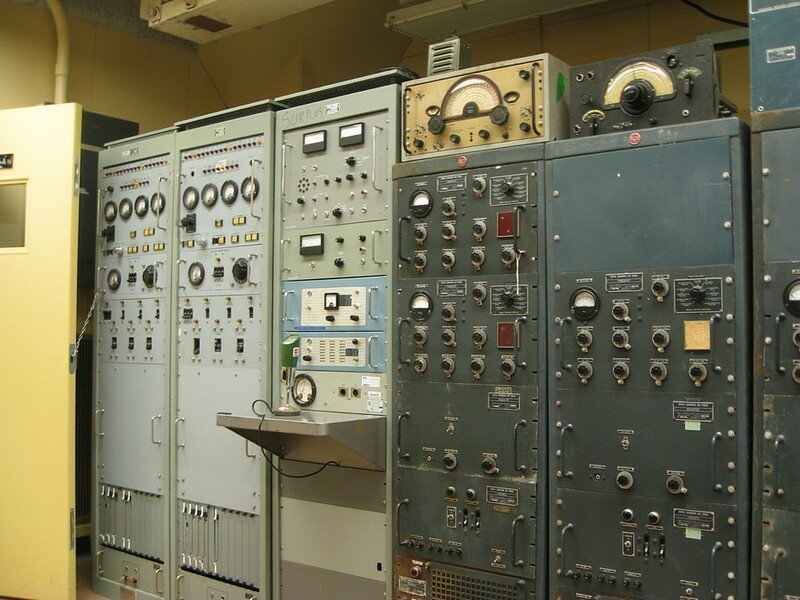 It was built to protect key members of the federal government and bureaucracy, along with a lot of Canada’s gold reserves, from nuclear attack. 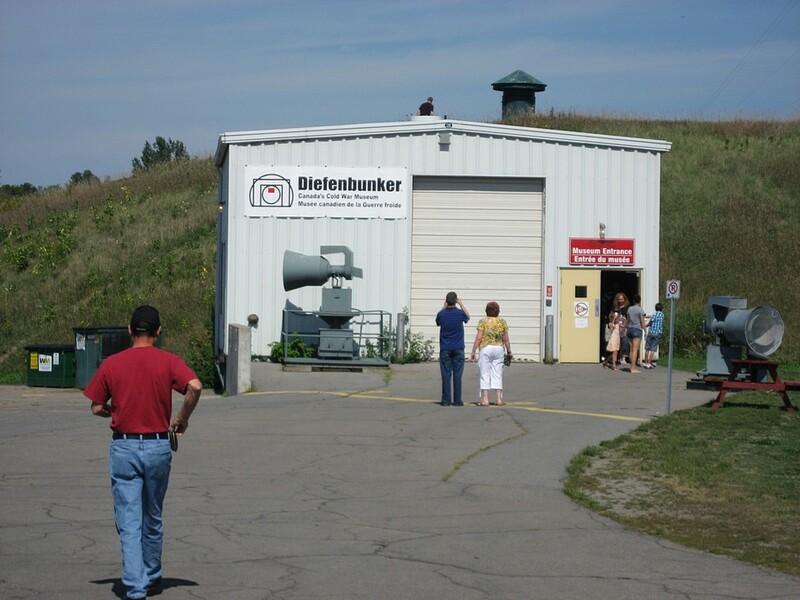 It was constructed when John Diefenbaker was Prime Minister (hence the name) in the early 1960s, decommissioned in 1994, and converted into a museum in 1998. 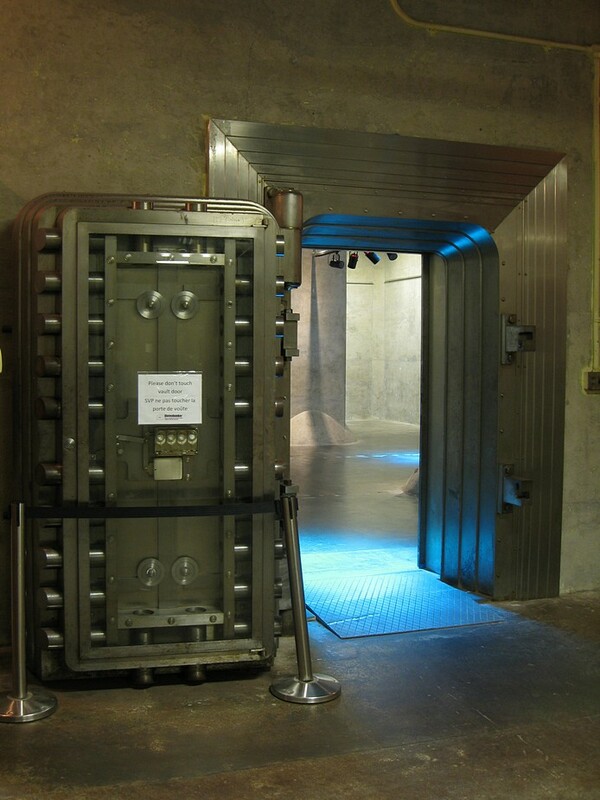 Adult admission is $14 (as of 2017), and you can spend a good 2 to 3 hours looking around the place, more if you want to explore every nook and cranny. After your visit to Carp you can return to Ottawa the same way you came. 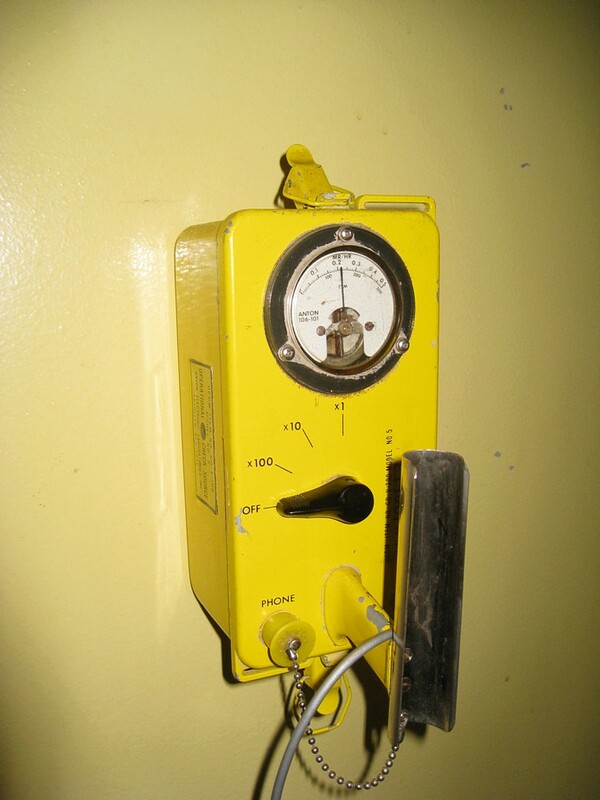 There is, however, one variation in the return route that you might want to consider. When heading back on Old Carp Road, turn right on Old Second Line Road instead of continuing straight ahead. 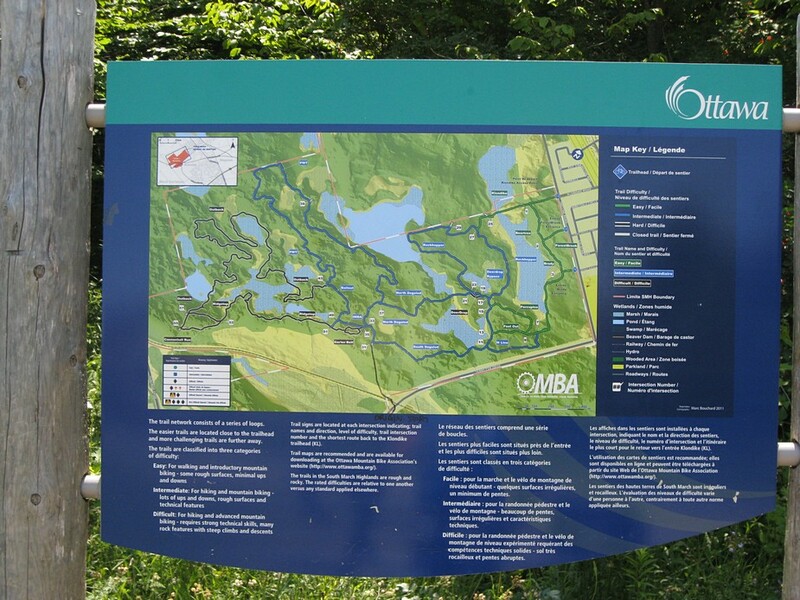 The interesting thing about cycling along Old Second Line Road is that you pass by the South March Conservation area which is home to the Kanata Lakes Mountain Bike Trails. These trails are a real hot spot for mountain biking in the Ottawa-Gatineau region, and almost all the cars parked alongside the road will belong to people riding the trails. The first entrance to the area (the one at the end of Klondike Road) has a sign with a map and description of the trail network. There’s also an outdoor bicycle repair station. 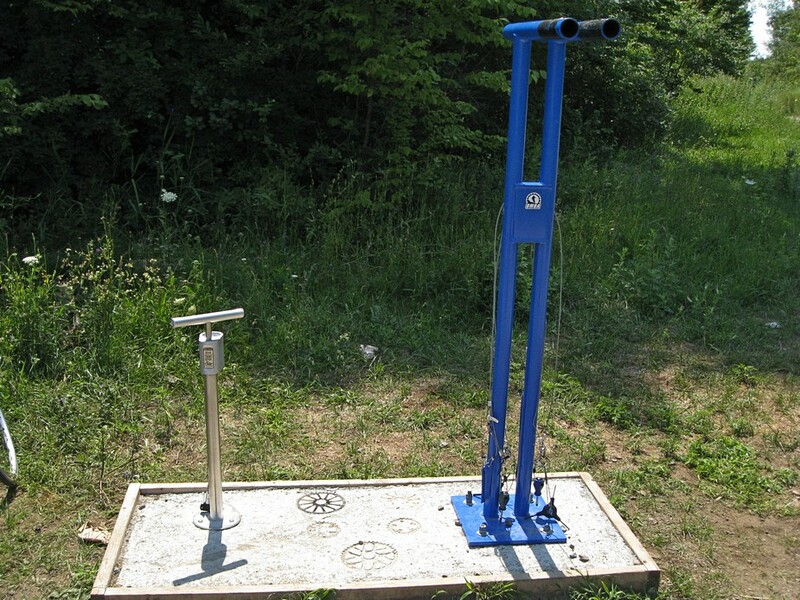 It consists of a makeshift bike stand, some tools that are attached to the stand with small cables, and an air pump. While this repair station may have been put there with mountain bikers in mind, it can be used by anyone needing to do some minor work on their bicycle. Continuing on Old Second Line Road will bring you to Terry Fox Drive, where you will turn left. 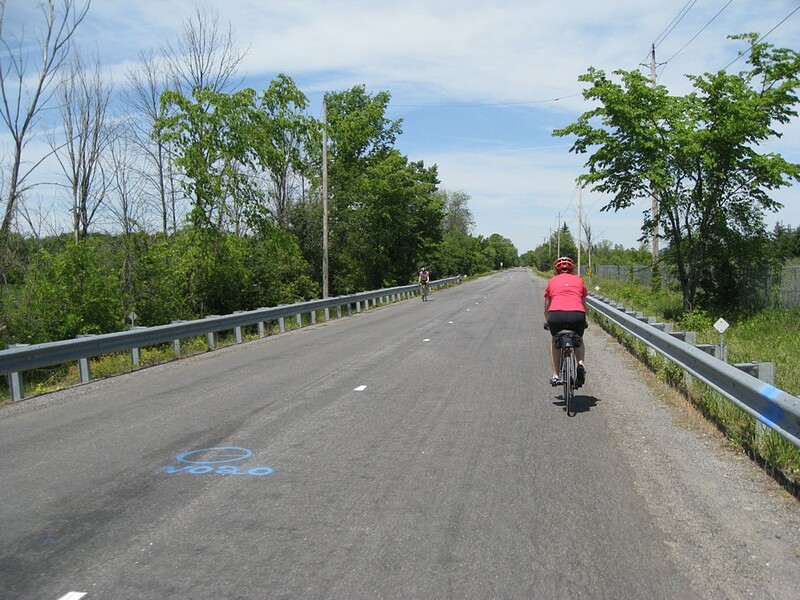 At this point you can ride on the paved shoulder of Terry Fox Drive (which is officially designated as a bike lane), or on a separate pathway that is a few dozen feet to the right side of the road. It’s your choice. 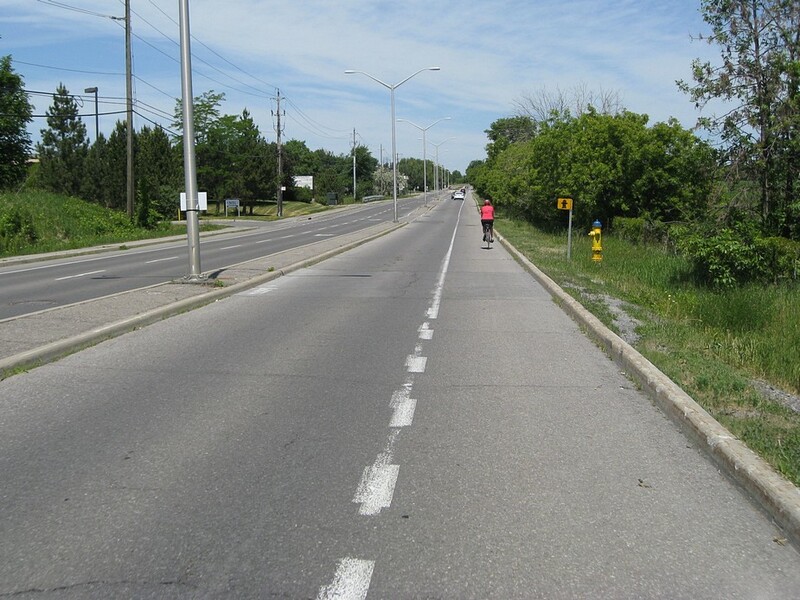 After crossing March Road, you’ll still be on Terry Fox Drive, but on a slightly narrower bike lane. It won’t be long before you pass by the Marshes Golf Course. From here, you’ll be able to retrace the route you took earlier in the day to get home. The route to Carp (alternate return route in green) Click here to see a larger scale map.